The Rise of the Combiners expansion, hitting stores in March, introduces combiner teams to the Transformers Trading Card Game. Players must collect each member of a team and then use an “Enigma” card to combine them into one gigantic robot. Rather than having two sides featuring their robot and alt modes, combiner team members have both of those on one side of their card, with the other side featuring a portion of their combined form. Most Transformers combiner team toys feature five robots—four limbs and a main torso, with all limbs being interchangeable. Devastator is a different sort of construct. His six components fit together in a specific way, and there’s no swapping them around. With six component robots—Bonecrusher, Hook, Longhaul, Mixmaster, Scavenger and Scrapper—Devastator is slightly harder to bring into play than combiners with only five parts. The end result is a massive metal beast with the health of six different robots combined, as well as a unique tower-building mechanic that really captures the construction vehicle theme of the team. In vehicle form, each robot (as seen in the slideshow above) has a special ability that contributes to the building of a tower. The higher the tower, the more benefits the robots’ combined form gains. It really is outstanding the way the game’s designers have incorporated themes from the show, comics and toys into the game. The Constructicons not only form one of the most formidable Decepticons in Transformers history, they’re also indulging in their passion for building. They create, they destroy. 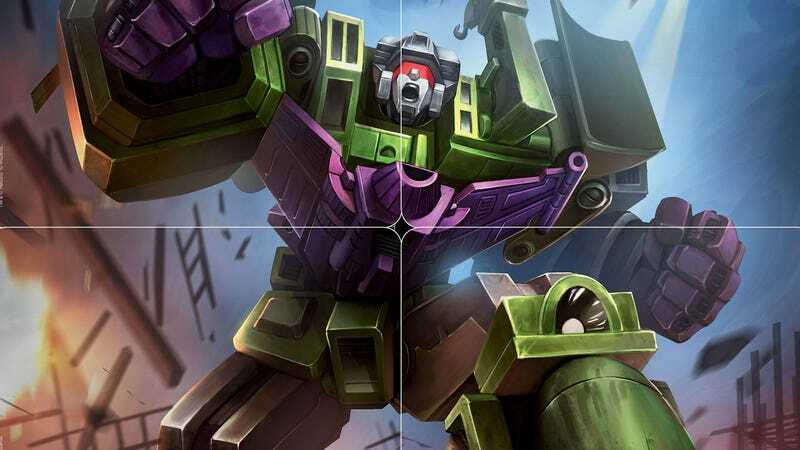 Devastator, in all his purple and green glory, arrives as a standalone Rise of the Combiners deck for the Transformers Trading Card Game on March 29.